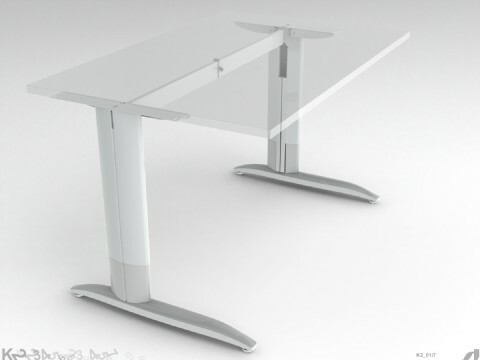 An Italian designed and patented ergonomic desk range. This cantilever desk comes supplied with all the necessary components, fixings and tools - all you'll need to do is just choose the top you need to complete the assembly. These X2 Cantilever desks are perfect for the home or office as computer desks, writing desks or even as reception desks. This desk kit is everything needed for a straight cantilever desk. We do also sell extension kits for the X2 desks that provide a return that creates an L shaped desk or a corner desk. We also offer a range of desk tops to go with these frames. Please use the link at the bottom of the page to browse the range which includes timber or glass options in a variety of finishes. Solid desk, custom cable cutouts were very well done for a perfect fit of my chosen accessories. Good product; however it showed as in stock upon placing order, delivery within 3 days - 3 days later I had a call to say it was actually not in stock and they were awaiting delivery from their supplier. Actually received item 2 weeks later. Customer service was OK, but not great at keeping me informed. Thank you for your comments and I can see from your review score, that you liked the product & it suited your application well - but apologies for the misleading information regarding stock. This desking is actually manufactured in Italy and as with the rest of southern europe, the factories all shut down during the month of august, into September which generally means our stocks tend to get quite depleted over the late summer. I've looked at the situation regarding this particular order you placed in September can I can see that the individual components had been marked as out of stock on our website, as they should have been - but the 'kits' which are made of up of a combination of the individual components were left in stock, which was a housekeeping oversight on our behalf. Sorry once again, and I can assure you that the hangover the european summer shutdowns bring each year, has been overcome and we've raised our stock holdings to cover next years holiday period.